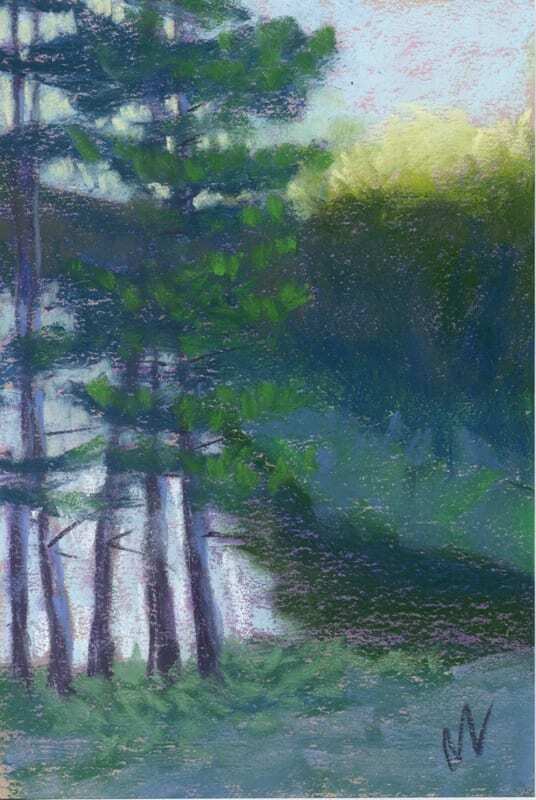 Tall Pines Over the Pere Marquette, 9×6″ pastel painting by Marie Marfia. Available $110. Made it all the way back to the first campsite but the second one was occupied so we had to cut our walk short a little bit. No worries. The view was spectacular as always and I’m glad I picked this particular dirt road for our walk today. This painting is available for $110 in my shop. This entry was posted in A pastel a day, Landscape, Manistee National Forest, painting a day, Pastels, trees, Woods scape and tagged art, manistee national forest, pastel painting, pastels, river, trees, water, woods on September 13, 2018 by Marie Marfia. Not everything works out the way it’s supposed to the first time you try it. I call these learning experiences. I still like them, even though they’re not what I expected. They’re different, but useful. They set up the next one, and the one after that, and the one after that. This entry was posted in A pastel a day, Landscape, painting a day, Pastels, seascape and tagged beach art, beach grass, clouds, cottage art, dune grass, Lake Michigan, love Ludington, ludington state park, sand dunes, shadows, snow, water on February 24, 2018 by Marie Marfia. I love this town, partly because if it even looks like there might be a nice sunset, everyone jumps in their car and heads down to the beach to watch it happen. This painting is a result of noticing the rush to the lake and joining in. I had to be quick. The good parking spots at the end of US-10 get taken early. And then, of course, it took three tries to get a painting that I liked. I don’t mind re-doing them when they’re this pretty, though. All those candy colors make me happy. Here’s a video of my process. Just so you know, there’s a little bit of a lag in the middle where someone came into the studio to chat and I had to stop for a few minutes. This entry was posted in A pastel a day, painting a day, Pastels, seascape and tagged art, art for sale, clouds, daily painter, dune grass, dunes, lake, Lake Michigan, Ludington, Michigan, pastel, pastel a day, sand, sky, snow, sunset, water on February 10, 2018 by Marie Marfia. You can lead a person to water, but you can’t make her drink. Well, actually, in my case, you don’t have to make me drink. I’ll do it all on my own. I like how the light comes right up to the lip of the dune where all the footprints are leading up to, and then it stops and everything from that point to the foreground and right off the edge of the paper is in shadow. I have spent a lot of time painting landscapes with roads or paths in them. Recently I noticed that the roads all end somewhere about a third of the way or two thirds of the way up the picture plane, and the end of the road is usually obscured by clouds or distant trees. This is probably something to do with me thinking about my future and wondering whether I’m going to go like my dad did, via Alzheimer’s, or if I’ll get lucky and be like my mother, who died with most of her faculties still intact. I like these dune pictures because the paths all lead to the water. I read somewhere that water represents spirituality when you dream about it. My water dreams aren’t very nice, but maybe if I keep painting water as a final destination they’ll change. Did I mention? We just moved my mother-in-law up to a memory care unit here in Ludington. It’s a lovely place. She’s doing well there. I stop by to see her a couple times a week, Steve does, too. It’s hard to watch someone you love losing their mind like this. And wondering if it’s going to happen to you, too. Nothing I can do but paint it out. 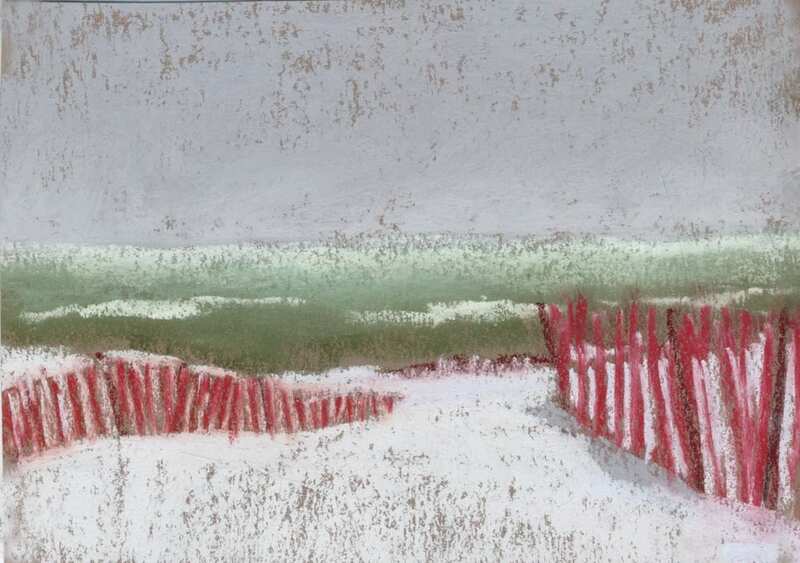 This entry was posted in A pastel a day, painting a day, Pastels, seascape and tagged art for sale, artist, beach, cottage art, cottage decor, daily painter, dune grass, dunes, grass, Lake Michigan, pastel, paths, sand, sand dunes, shore, small art, water on February 9, 2018 by Marie Marfia.